This CTS Knowledge Base article describes the manner which ash accumulates in the DPF. Distribution of the ash, whether in a layer along the walls or packed in a plug at the back of the DPF channels plays a critical role in ash cleaning, as do the characteristics of the ash deposits themselves. Ash accumulation occurs in the DPF over thousands of hours and tens of thousands of miles. The ash may lodge in the filter pores, form a layer along the filter surface, or pack in plugs toward the back of the filter channels. In some cases, ash bridging may also occur where the ash blockages form near the middle of the filter, effectively blocking flow through the remainder of the channel. The location of these deposits play an important role in determining the best method of DPF cleaning to remove the ash. 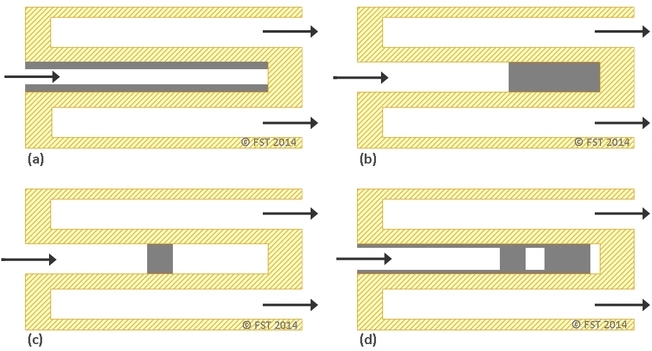 Figure 1 depicts the two basic locations where ash often accumulates in the DPF channels, either in a layer along the walls (a) or as a plug packed at the back of the channel (b). A consequence of ash accumulation in a layer along the channel walls is a reduction in channel diameter. On the other hand, ash accumulation in the end plugs reduces the available channel length, as there is effectively no flow through the plugs. Ash bridging, as shown in (c), is less common but can have a detrimental effect on filter performance by obstructing the flow through the remainder of the channel. Analysis of field-return DPFs generally shows some combination of (a) – (c) as illustrated in (d) although the relative proportions of the ash in each location can vary significantly between filters. Figure 1: Schematic of ash distribution in Diesel Particulate Filter (DPF) showing (a) ash accumulated in a layer along the cell walls, (b) ash packed in a plug at the back of the Diesel Particulate Filter (DPF), (c) ash bridging across the channel, and (d) typical ash accumulation. In all cases, the effect of the ash build-up in the DPF is to restrict exhaust flow, either by narrowing the channels or decreasing their length, and to displace the filter volume which would otherwise be available to trap the soot. The factors controlling the location of the ash deposits and the ultimate distribution of the ash in the DPF is the subject of much ongoing research, although circumstantial evidence points to the regeneration strategy, exhaust conditions, and quality of the re generations all playing important roles [1, 2]. X-ray analysis provides a powerful technique for looking inside the DPF to understand the characteristics and distribution of the ash. Figure 2 presents a series of x-ray images from a heavy-duty, 12 inch (30.5 cm) diameter cordierite DPF at CTS. The filter was previously removed from fleet service in an on-highway application. The x-ray image of the axial cross-section clearly show ash plugs filling over half of the filter. Voids are also visible within the ash plugs, as is some sintered ash (brighter white color) at the back of the ash end plugs. This sintering was most likely due to a high temperature event early in the life of this DPF. 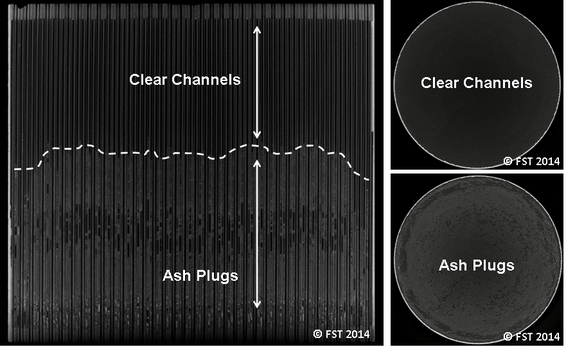 Figure 2: X-ray images from heavy-duty (12 inch) diameter Diesel Particulate Fitler (DPF) inspected at CTS showing ash plugs blocking over 50% of the channel length, with voids in the middle of the ash plugs and sintered ash towards the back of the Diesel Particulate Filter (DPF). The radial cross-sections of the DPF in Figure 2 provide an alternate perspective of the ash plugs filling the lower half of the DPF channels, and the relatively clear channels towards the front half of this DPF. The video in Figure 3 provides a reconstruction of a series of x-ray images showing the ash distribution throughout this entire filter. Note the voids present in the ash plugs, the difference in ash plug lengths, and the brighter, more densely sintered ash towards the bottom of the DPF (outlet side) in the video. Figure 3: Video reconstruction of X-ray imaging of heavy-duty (12 inch) diameter cordierite DPF inspected at CTS. Video corresponds to the sequence of still images shown in Figure 2. The increase in exhaust flow restriction through the DPF and loss in soot storage capacity is directly affected by the distribution of the ash within the DPF. Ash distribution and its impact on filter performance affects the ash cleaning interval, and more importantly the ease or difficulty of ash cleaning. Different cleaning methods are better suited for removing different types of ash, whether along the channel walls or packed at the back of the filter in the end plugs. Dittler, A., “Ash Transport in Diesel Particle Filters,” SAE Technical Paper 2012-01-1732, 2012, doi:10.4271/2012-01-1732.